Louisville quarterback Lamar Jackson entered this season as a relative unknown, with more than one hurdle to clear. NEW YORK -- Louisville quarterback Lamar Jackson entered this season as a relative unknown, with more than one hurdle to clear. He'll exit it with the Heisman Trophy. Jackson capped his remarkable rise with the first Heisman Trophy in school history, having wowed enough voters -- despite losses in his final two games -- with 51 total touchdowns and 4,928 total yards. What Jackson accomplished in 2016 goes down as the greatest season ever at Louisville -- a school where Hall of Famer Johnny Unitas starred in the 1950s. "To be able to stand up here with all the former winners, I'm extremely proud to represent this class and Louisville as their first Heisman Trophy winner," said Jackson, who wore a Louisville-red velvet blazer with shiny black lapels. "For my teammates, it's an award for all of us. I can't wait to cherish it with all of you." Jackson won with 2,144 points;Deshaun Watson finished second with 1,524. Oklahoma quarterback Baker Mayfield (361 points), Sooners running back Dede Westbrook (209) and Michiganall-around star Jabrill Peppers (208) placed third through fifth, respectively. Jackson received 79.5 percent of possible points received, the fifth-highest total in the last 50 seasons of Heisman voting, while the gap between Watson and Mayfield was the largest in the past 70 years. Jackson became the youngest player to win the Heisman at 19 years, 337 days -- just five days younger than 2013 winner Jameis Winston -- and just the fourth sophomore to take home the trophy. He joins Johnny Manziel (2012) as the only Heisman winners to throw for 3,000 yards and rush for 1,000 yards in a season. Quarterbacks have won the Heisman Trophy in 14 of the past 16 years. "Man, I almost cried," he said. "To hear my name called with all those great players, I was overwhelmed." Jackson had a speech prepared but he stopped at various points to say, "This is crazy." He got through the written portions while also improvising, saying his speech "started coming from the heart." "To be the first person from Louisville to win it, it's an honor. I'm humbled." His coach, Bobby Petrino, said after that ceremony that he was "very nervous" for his quarterback. "I had no idea how the vote was going to come out," Petrino said. "I want you to know how proud I am of Lamar. He's a young man that prepared extremely hard, went out on the field and played as hard as he possibly could and did a great job being a leader for this football team." "Everything I do is for my mother," Jackson said Saturday. Jackson was the best offensive player in college football this season. Among quarterbacks, he rushed for an FBS-best 1,538 yards, rushed for 21 touchdowns (second in FBS), had 4,928 yards of total offense (second), and a Total QBR of 86.6 (third). He is the first Heisman winner to play on a team that lost its last two games of the regular season since Tim Brown of Notre Dame in 1987. He's the first to enter the postseason without a chance to win the national title since Manziel of Texas A&M in 2012. Brown, Manziel and past Heisman recipients attended the ceremony Saturday night. For Clemson's Watson, his season began with favorable Heisman odds on his side. He also was the overwhelming preseason media choice to repeat as ACC Player of the Year. But opinions quickly changed after Jackson accounted for eight touchdowns in three quarters against overmatchedCharlottein the season opener. Then he totaled over 600 total yards and five more touchdowns in a 62-28 win over Syracuse, including the "Lamar Leap" over a defender that will forever be part of his highlight reel. Those two games were against overmatched opponents, though. Then-No. 2 Florida Statecame next, and Jackson dismantled the Seminoles with ease. He recorded 362 yards and five total touchdowns in three quarters in a 63-20 victory that sent a clear message: Jackson had to be considered the Heisman favorite. Jackson's stat line against the two toughest teams on his schedule: 511 yards passing, 308 yards rushing, eight touchdowns and two interceptions. His season did not end as prolifically as it began, with consecutive losses to Houstonand Kentuckythat some thought might curtail his Heisman chances. Still, Jackson won ACC Player of the Year honors from the media and coaches, and he took home the Walter Camp Player of the Year and Maxwell Award. Jackson is the third player in FBS history -- joining Cam Newton and Tim Tebow -- with 30 passing touchdowns and 20 rushing touchdowns in a season. He set ACC and school records for touchdowns responsible (51) in a season and yards in a single game (610, versus Syracuse), plus school records for most single-season rushing yards (1,538) and most touchdowns in a single game (eight), and he became the first quarterback in school history with a 1,000-yard rushing season. After finishing third in the balloting in 2015, Watson, meanwhile, became the 11th player with multiple top-three finishes without a Heisman win and the first to do so sinceAndrew Luckduring the 2010-11 seasons. It is only the seventh time in Heisman history -- and first since 2008 (Oklahoma's Sam Bradford and Texas' Colt McCoy) -- that the winner and runner-up hailed from the same conference. "I thought about it a lot growing up, playing the NCAA video games," Jackson said. "I was like, 'Man, it would be great to go to college and win that award.' So just to be sitting here right now and having my name talked about, it's crazy." 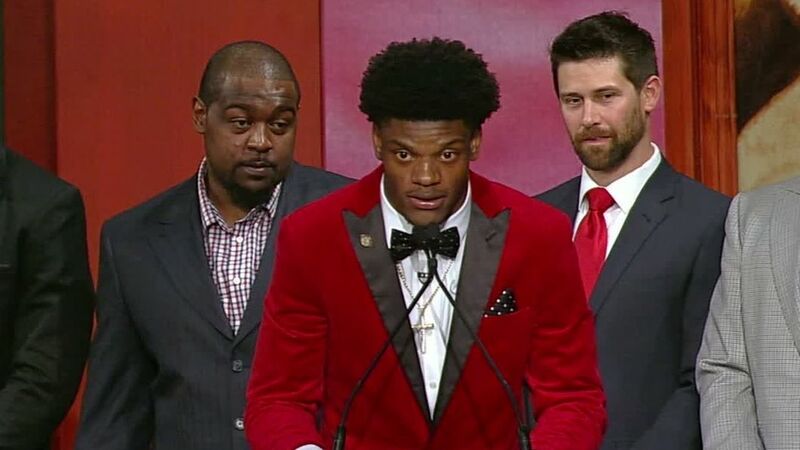 Louisville QB Lamar Jackson wins the 2016 Heisman Trophy, becoming the youngest winner of the award. Lamar Jackson's remarkable season earns him the Heisman Trophy.